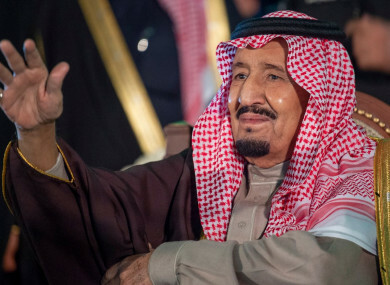 SAUDI ARABIA’S KING Salman ordered a sweeping government reshuffle yesterday replacing key security and political figures including the foreign minister, as the kingdom grapples with the international fallout over critic Jamal Khashoggi’s murder. In other significant appointments, Prince Abdullah bin Bandar was named chief of the powerful National Guard, and Musaed al-Aiban, a Harvard graduate, was appointed the new national security adviser. The energy, economy and finance ministries were left untouched even as the petro-state faces a sharp fall in crude prices that has generated renewed uncertainty over Prince Mohammed’s Vision 2030 reform programme for a post-oil era. But the appointment as foreign minister of Assaf, who holds a seat on the boards of state oil giant Aramco and the vast Public Investment Fund, indicates an emphasis on “economic diplomacy” as the kingdom seeks to reassure foreign investors rattled by the Khashoggi crisis, analysts say. Assaf was held in Riyadh’s Ritz-Carlton hotel last year along with hundreds of elite princes and businessmen, in what the government called an anti-corruption crackdown. The reshuffle comes as Saudi Arabia seeks to repair its tarnished image after Khashoggi’s murder, widely seen as its worst diplomatic crisis since the September 11, 2001 terrorist attacks on the United States, in which most of the hijackers were identified as Saudi nationals. “You cannot delink Khashoggi from any developments, though government reshuffles are customary every four years,” said Mohammed Alyahya, a senior fellow at the Gulf Research Centre. Saudi Arabia last week said it was creating government bodies to boost oversight of its intelligence operations, in the wake of the murder. The kingdom has said Khashoggi was killed inside its Istanbul consulate in a “rogue operation” led by Saudi agents, but the CIA reportedly concluded that Prince Mohammed ordered his assassination. The murder has battered the reputation of the 33-year-old crown prince, who controls all major levers of power. He is set to maintain his political and security posts after Thursday’s reshuffle, including that of defence minister. Saudi Arabia last week slammed as “interference” a US Senate resolution that held Prince Mohammed responsible for the killing, and another that sought to end American military support for the Riyadh-led war in Yemen. “The primary bone of contention between Saudi Arabia and American lawmakers is the power of Prince Mohammed and his responsibility for the murder of Khashoggi,” said Ryan Bohl, from the US geopolitical think tank Stratfor. Email “Saudi king orders government reshuffle after fallout over Khashoggi murder”. Feedback on “Saudi king orders government reshuffle after fallout over Khashoggi murder”.